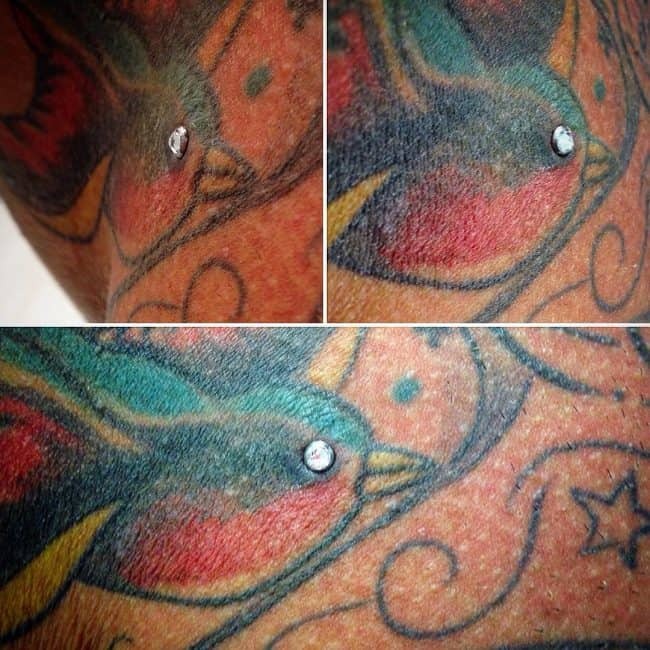 As far as body adornments are concerned, dermal piercing is becoming more and more famous these days. This can be confirmed by the great numbers of individuals in the world who are trying this unique and gorgeous adornment on the body. 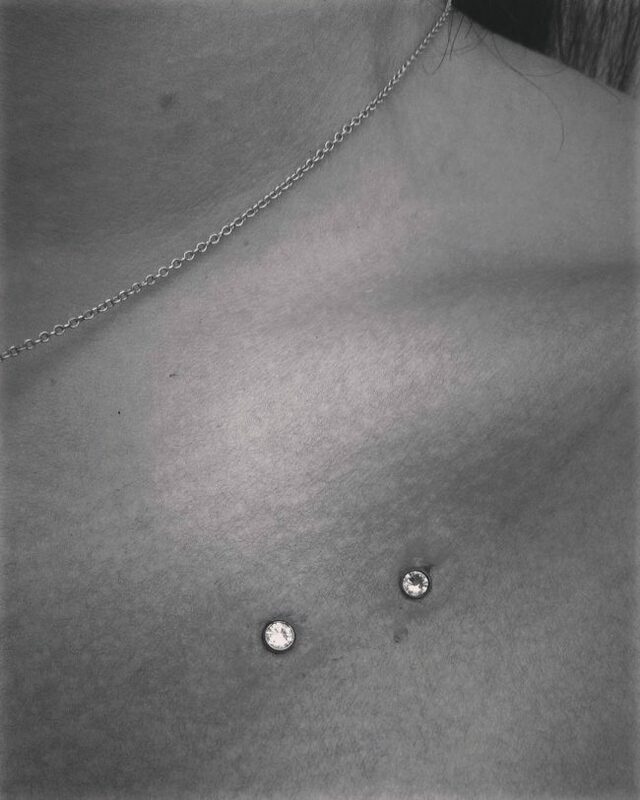 This is a great alternative to those common kinds of piercings that may take time to attach on your body. 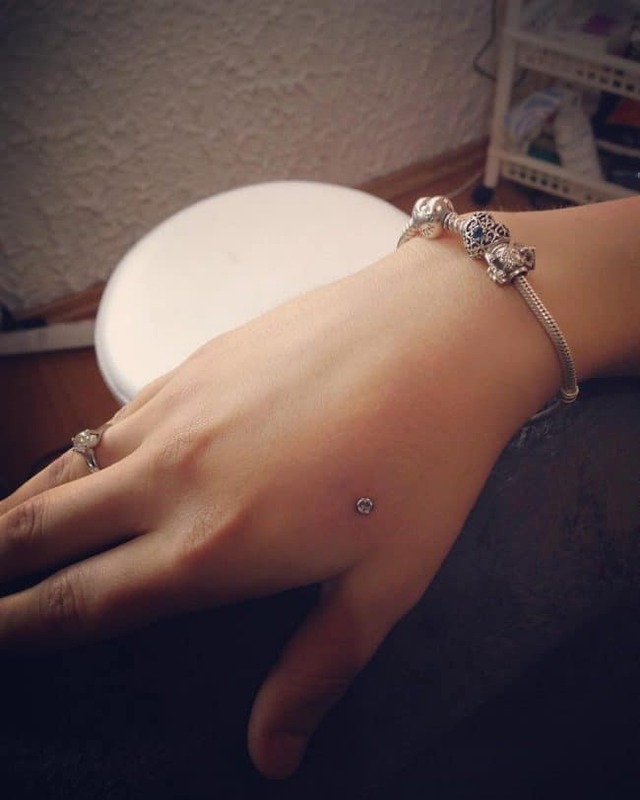 In some cases,it is also is called micro dermal piercing. The truth is, there are several names associated to this kind of piercing. Some of these are micro dermal implant, single-point piercing, and dermal anchor. This is slightly different to the ordinary piercing since it only has a single point. Meaning to say, it has no point of entry and point of exit, which can be found in an ordinary piercing. Basically, it has two components, and these are the anchor and the piece of jewelry. 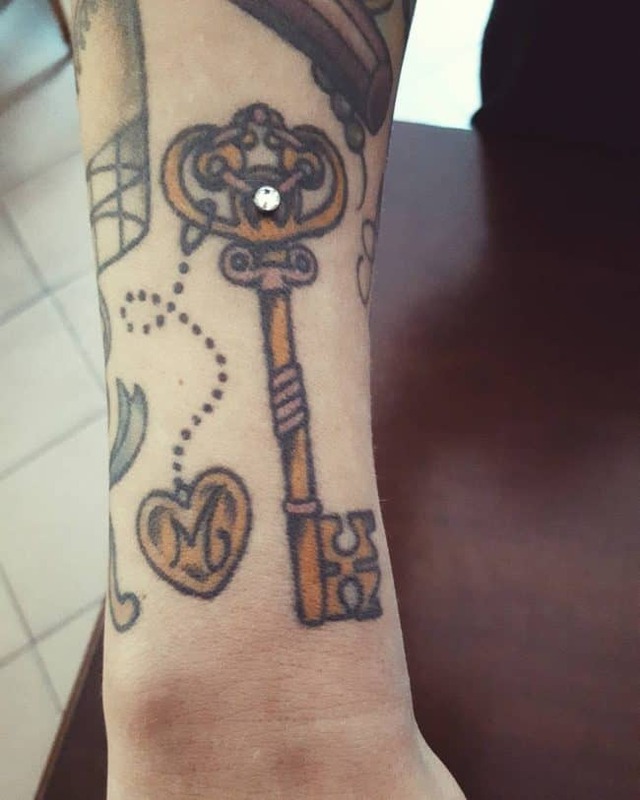 The anchor part is the one that is being pushed inside the skin, and the piece of jewelry is the one that you can see on the surface. Of course, these 2 components are connected together by the so-called post. There are two kinds of anchors. First is that one that has holes, while the second one is the solid anchor, or the one with no holes. 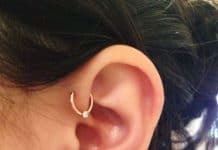 If you want a stable piercing that will last longer, then opt for a holed one. The tissue will grow into the holes, which is why it is more stable. The problem however, is that it will be much harder to be removed from the body. Most of the time, the 2 important components especially the anchors are made from titanium or stainless steel. The top jewelry on the other hand, is commonly made from more expensive and beautiful materials such as gold and diamond. 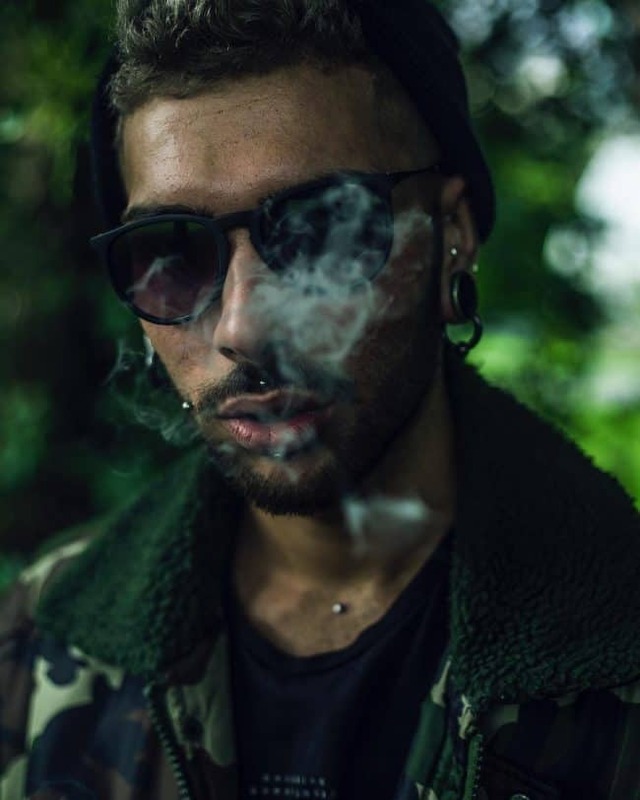 Unlike the procedure involved in attaching an ordinary piercing on the body, piercing procedure will focus more on attaching or inserting the anchor piercing and jewelry into the skin’s microdermal layer. The jewelry will then be the visible part of the piercing. This is a crucial procedure, so a professional dermal piercer must be the one who would perform the entire procedure. Remember, the titanium or stainless steel anchor will be inserted inside the skin. 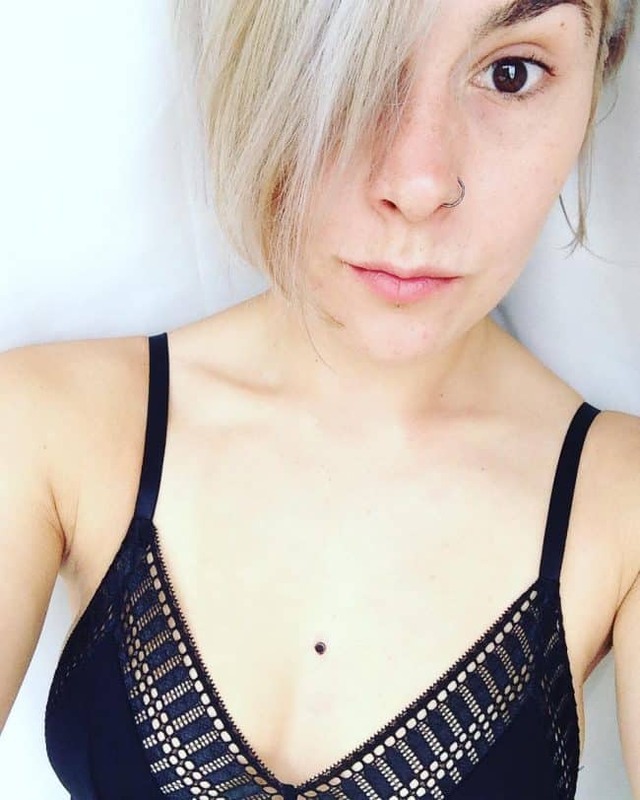 One important thing that should not be forgotten is that this piercing is only applicable on flat skin surfaces, usually those that are less accessible by the typical dual-pointed piercings. The procedure can never be done successfully without the presence of a very significant small piercing equipment, which is called a dermal punch or simply a piercing needle. 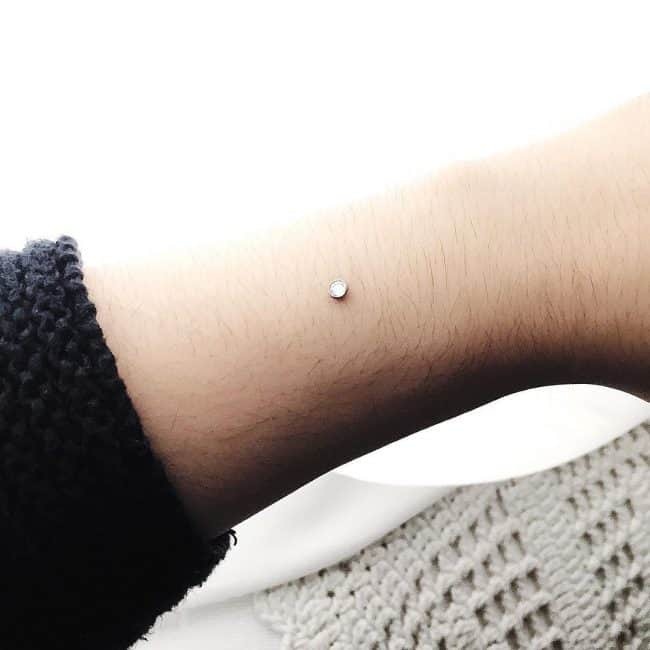 When compared to the piercing needle, the dermal punch can only cause minimal pain, which is why it is the most preferred one when as far as this piercing is concerned. The very first thing done in the whole process is determining the piercing point. Right after identifying, it is then sterilized and a surgical marker will be used in marking the point. With the use of micro dermal punch, some skin tissues are going to be removed. After removing, the anchor part will be inserted beneath the skin, and the jewelry that will appear on the surface will be placed with the help of surgical forceps. That is how the procedure goes, and it will take you an hour. Most of the time, the entire process would take you $40 to $120. 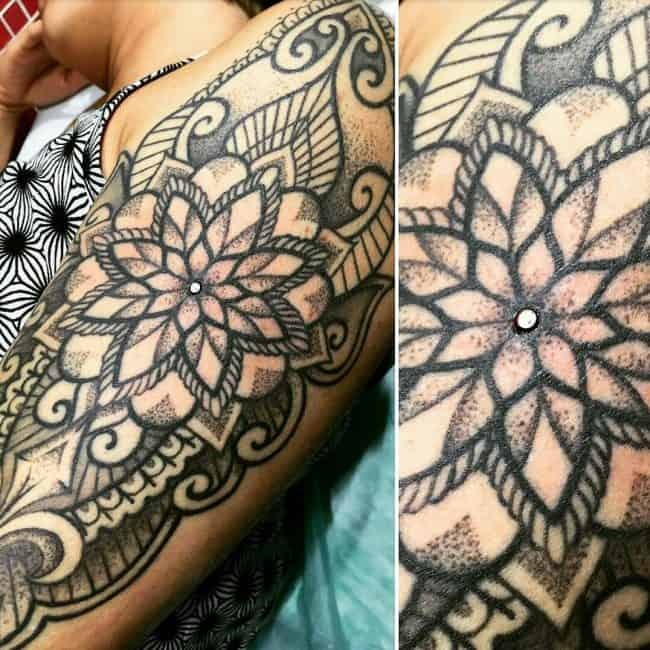 There is always a cost associated with dermal piercing, unless the professional piercer is your friend or offering his or her service without any charges. This is the main reason why you need to get ready with your budget. There are several factors that can affect the cost of the entire process. One is the professional piercer himself/herself. 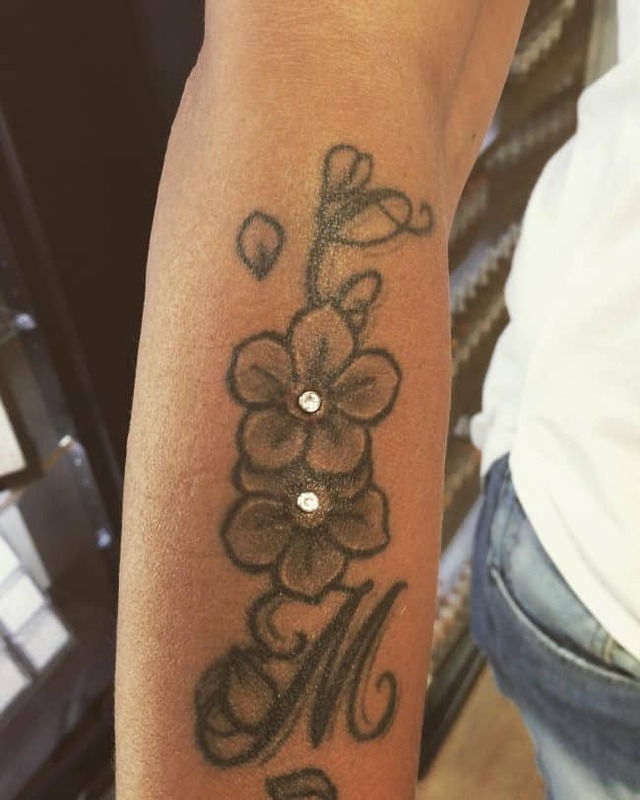 If you go for an extremely credible and celebrated piercer, then his or her service would probably cost much. But at least, you can have the assurance that everything will go smoothly and in the right way. Another factor that can affect the cost is the jewelry you choose. Keep in mind that every jewelry option you can have varies in prices. The higher the price of the jewelry, the more expensive the cost of process will be. Another price-affecting factor is the coverage of the piercing process. Meaning to say, if you want to have this piercings in several parts of your body, then you will surely pay more. 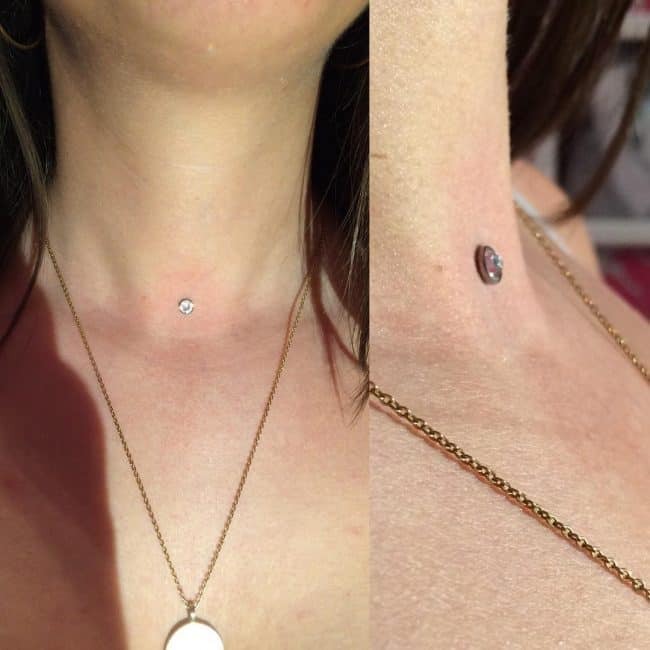 In case you are one of those people out there who keep on asking if micro dermal piercing can bring some pain, then the answer is a big yes. Yes, it can hurt just like undergoing the procedure of getting pierced with the ordinary piercing. Well, there is no question about that since it involves penetration into the skin with the use of a needle or the so-called punch. But the truth is, the pain that can be felt will always depend on the person who is getting this piercing. It is simply because of the different pain tolerance level of one person to another. Some people may find it very hurtful, and some may just find it nothing but an ant bite. When we try to scale the pain level, many people said it is on the 5th up to the 7th level out of 10 levels, which has 10 being the highest. 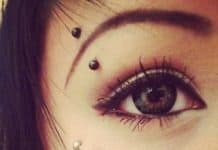 Even so, it has been said that pain that can be felt with this piercing is just a half of pain that can be acquired from getting pierced with an ordinary piercing. If you are brave enough, and desperately want to have this, then there is no way you cannot handle the pain it may bring. In a normal scenario, a bandaid will be placed in the pierced area when the dermal piercing procedure is completely done. The bandaid should stay within a few days, in order to protect the area from infection-acquiring pollutants like dust and dirt. 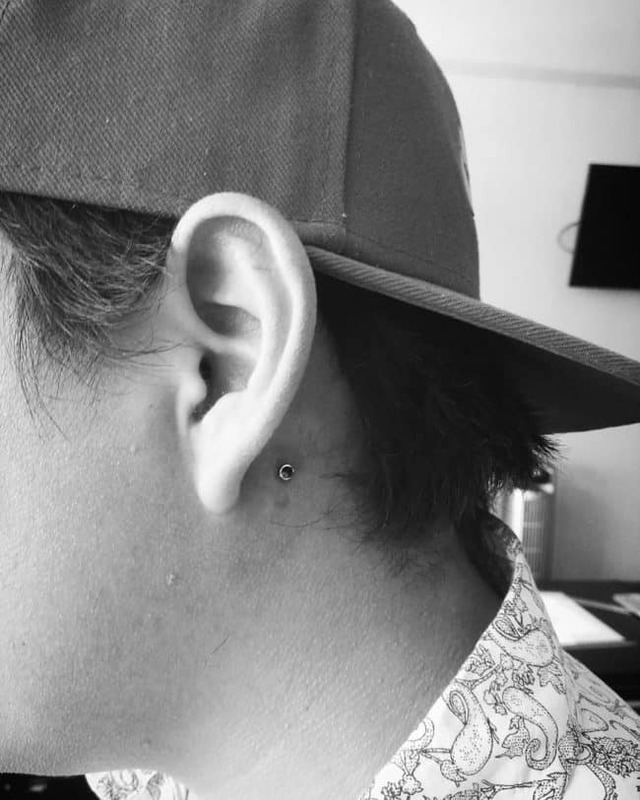 Now when talking about the healing process, it would probably take you 3 months before you can finally say that the pierced area is fully healed already. With that being said, you surely need to have a lot of patience with you. Moreover, how you take good care of the pierced area will also play a very significant role in the entire duration of the healing process. If you are careless enough, then be ready to have more long days to wait until it finally heals. 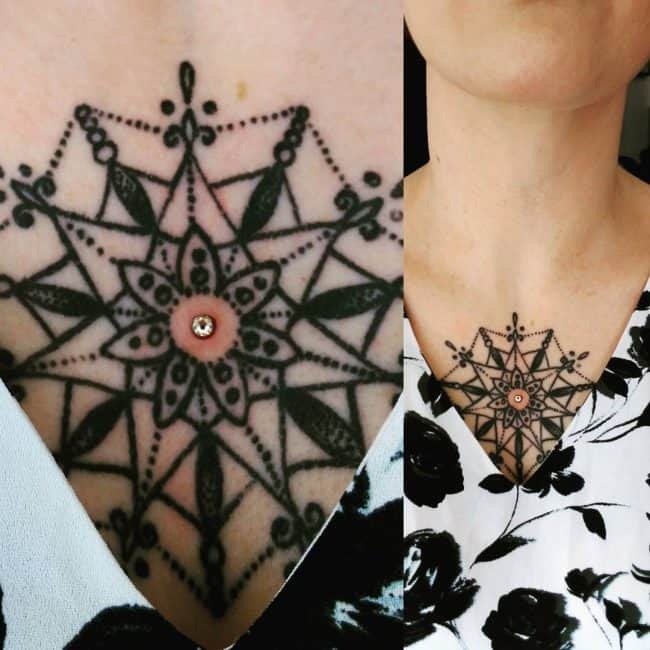 As a matter of fact, there are those people who were unable to have a fully healed pierced area and display their gorgeous piercings because it ended up a major problem to them. They did not take good care of the pierced area, resulting to severe infections. Thus, if you don’t want to be like them, be sure to do your part responsibly. Do not dare to touch the pierced area, as much as possible. This is a very important thing to keep in mind because your hands are normally full of bacteria, acquired from the environment and the things that you have touched. The bacteria might be transferred on the pierced area, which will then develop into minor and severe infections. So, you need to be careful. Avoid pulling the jewelry. This is a thing you should not do. Why is it so? It is simply because the tissues that surround the pierced area are delicate enough, to the extent that they can be already irritated in just a single pull of the jewelry. When putting on your clothes, you should be mindful enough not to touch and pull jewelry. 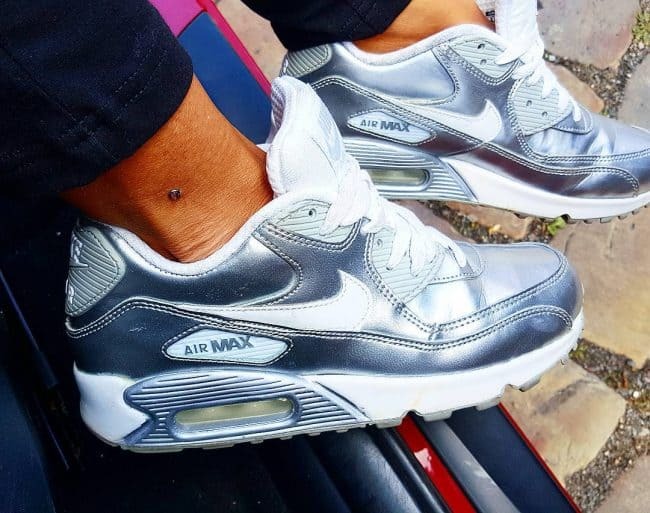 Clean the pierced area with a salt solution. You might say that, what in hell is this salt solution? Well, there is actually no need to get your temper high here since a salt solution is simply a product mixture of water and non-iodized salt. Meaning to say, it can be easily prepared at home. What you need to do is get a cup of warm water along with some amount of non-iodized salt (around ¼ teaspoon), and mix them together. You can just spray it directly to the pierced area, or apply it using your fingers. However, be sure to wash you hands first. Always pat dry the pierced area. Keep in mind that the area is prone to irritation when it is not yet fully healed, so you need to be gentle in drying it. You need to be very gentle. Make use of a well-cleaned towel or never been used tissues. Remember, used tissues and towels may become the breeding grounds of bacteria, and you don’t want these bacteria to infect the pierced area, right? Do not try to remove the jewelry or change it with a new one, without the help of a professional. If the pierced area is not yet fully healed, removing the jewelry and change it with more gorgeous one is certainly a big no. If it is fully recovered already and you want to change it, removing it on your own is also not allowed. Remember that some tissues may already grow and stick on the anchor of the jewelry, making it a bit difficult for you to remove. This is the main reason why the help of a professional is needed. Crystal Blue Dermal Set – This jewelry option is composed of 5 crystal piercing that are linked together. The center piece is bigger in size, followed by a medium-sized crystal on both sides, and then followed by smaller crystals placed on both sides. Its price is around $49.95. 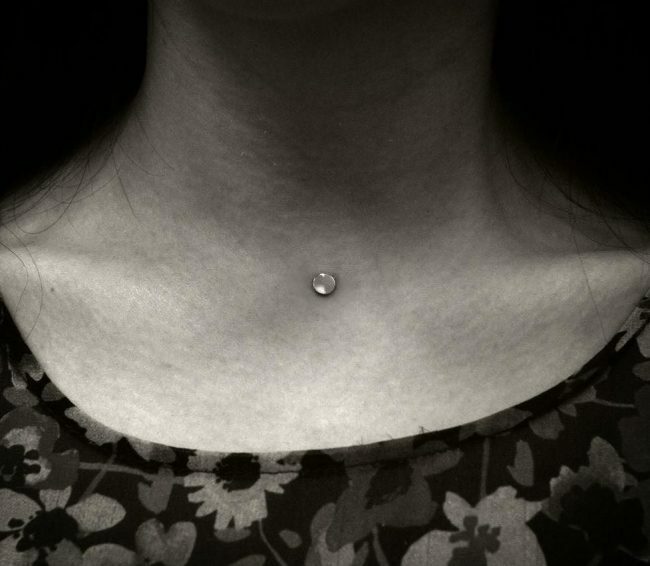 6mm Dermal Head – Buying this one would cost you around $18. Red Dermal Head – This is a beautiful micro dermal implant that is priced $10. 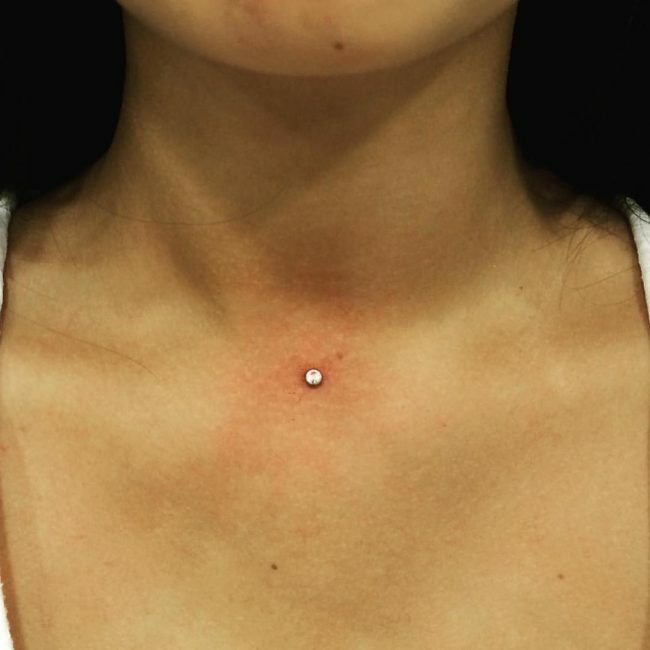 Fire Opal Micro dermal – Prepare $12.95 if you want to buy this stunning piercing. Fuchsia Skull Anchor Top – It is a bit expensive on a price of $19.95. 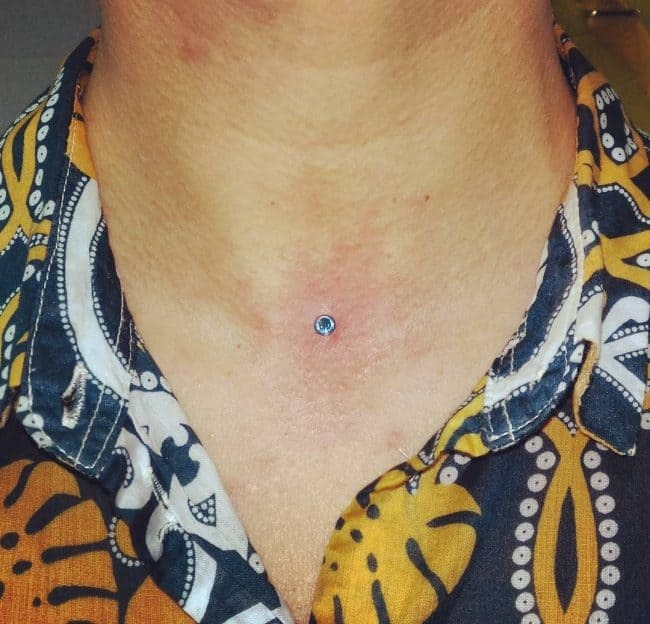 Turquoise Stone Micro dermal – You can get it for as low as $10. Dragon Green Dermal Head – All you need to have is $18, and you can already have this beautiful micro dermal implant. 3mm Anchor Top – $12 is the price of this piercing. 5mm Opal Stone – You need to raise $16 before you can buy it. 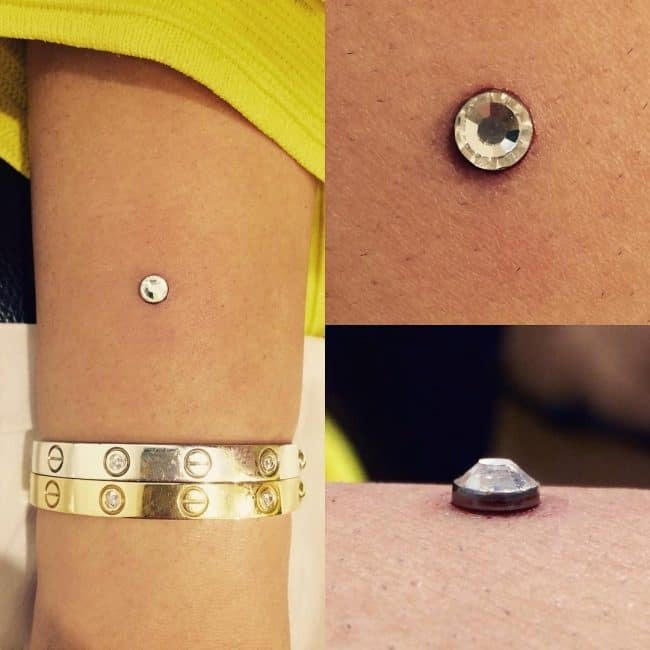 Of course, you can always have your own sets of gorgeous micro dermal piercings whenever you want to. Even so, you should be knowledgeable enough about this piercing as well as the entire process involved into such thing. It is simply because a piercing process may become a complicated treatment process, if you are irresponsible enough as a piercing wearer. This is certainly a horrible thing that you do not want to happen, right? If yes, then be sure to keep all of those important bits of information in mind before you dare to undergo the procedure on some parts of your body. Always put your safety as your number one priority, before anything else.